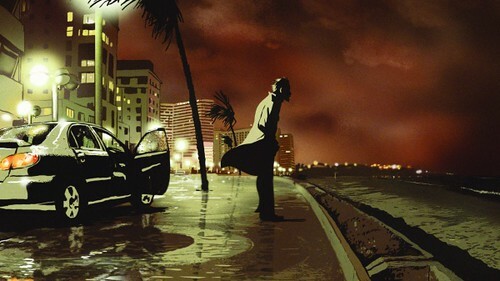 Having made Waltz with Bashir from the point of view of the common soldier, I've come to one conclusion: war is so useless that it's unbelievable. It's nothing like you've seen in American movies. No glam, no glory. Just very young men going nowhere, shooting at no-one they know, getting shot at by no-one they know, then going home and trying to forget. Sometimes they can. Most of the time they cannot. so says ari folman, writer, director and producer of waltz with bashir. it is an incredible animated documentary of ari's journey to remember his involvement with the israeli army in the lebanon war of the eigfhties. the story, the drawing and the music are all breathtaking. I saw this at the New York Film Festival and got to hear Ari Folman talk about this film at a press conference - moving beyond belief. It reminded me a bit of Perisopolis, the animated Iranian film i had seen the previous year at the film festival. gutted i missed this. look forward to the dvd release. bought 'perisopolis' the other day, am looking forward to watching it. will let you know what i thought.